In a few hours I will be heading off to Germany for a two-week concert tour. I will be posting updates here while I’m away, but before I go, I wanted to explain how the tour came about. 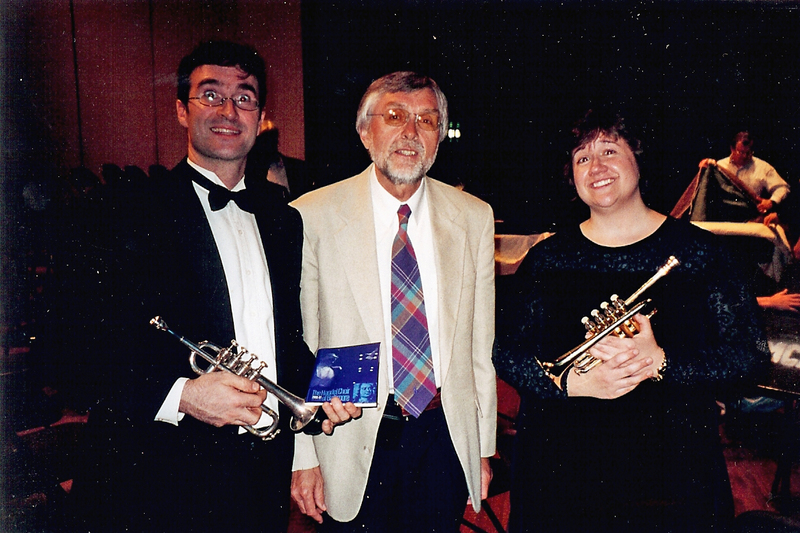 Jim Sherry, Kurt Oberschäfer (center), and Elisa Koehler after a performance of Bach’s B Minor Mass in April 2001. For the past fifteen years I have enjoyed performing Baroque music with several groups in the Baltimore area. At one performance of Bach’s B Minor Mass in 2001 with the Handel Choir of Baltimore directed by T. Herbert Dimmock, noted Bach scholar Christoph Wolff presented a pre-concert lecture. Also in attendance were Dr. Wolff’s friends, Rev. Kurt Oberschäfer and Rev. Otfried Arndt. To make a long story short, I had the pleasure of seeing Dr. Wolff, Rev. Oberschäfer, and Rev. Arndt at subsequent performances of Baltimore’s Bach Concert Series (also directed by Dr. Dimmock) over the years and they very kindly invited me to perform in Germany. I am planning to post some videos from Germany, if possible. Stay tuned. Good luck, Elisa! I’m sure that you’ll sound fantastic! Just one nit-picking comment: You mentioned that the instrument originated in “Mo-day-na” Italy, which is the birthplace of the late Luciano Pavarotti and Mirella Freni also. He used to pronounce the town’s name as “MO-den-a”. I capitalized the first syllable for emphasis, since I don’t know the proper language symbols. Oh well. You’ll make us so proud, Elisa! Have a wonderful time! and thanks for the recipe – I loved them last season when you brought them to rehearsal!